Okay, so as a book reviewer, I’ve read and reviewed plenty of “Why?” books that answer those ongoing, ear-bending questions children ask over and over again – why…why…WHY? So when I received Why? The Best Ever Question and Answer Book, by Catherine Ripley, I didn’t expect it to be any different from the others. I was wrong; it is different. IT’S WAY MORE FUN! Why? 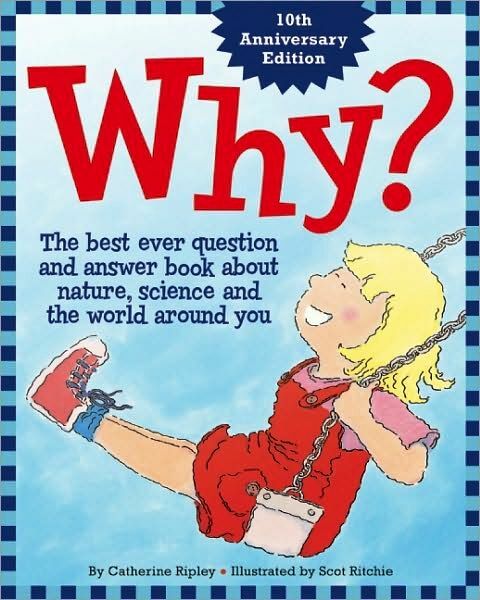 The Best Ever Question and Answer Book about Nature, Science and the World Around You, by Catherine Ripley, is the perfect book to answer all those never-ending why questions. First, it’s a hard back, so it’s built to withstand those impatient little fingers ripping through the pages in search of life’s most important answers. Next, it has a colorful, kid-friendly cover with a rambunctious-looking girl swinging and grinning just below a giant-sized WHY?, as if issuing this dare: “Go on, ask all the questions you want; our ears never get tired!” And perhaps most important of all, this is not a “little” book; there are 189 glorious pages chocked full of creative kid-questions and snappy adult answers. What more could anyone ask? Why? is as clever as it is adorable. The sections are organized and cohesive; for example, there are Bathtime Questions (like, Why do some shampoos sting?, and, Why do I have to go to the bathroom? ); Supermarket Questions (like, How does all this food get here?, and, Do the doors open by magic?). There are also Nighttime Questions, Outdoor Questions, Kitchen Questions and Farm Animal Questions, all of which comprise actual questions submitted by actual OwlKids book readers. Ripley’s text is ripe with love, humor and…yes, respect! She’s an author who does not talk down to children, but treats their relentless questions as if they are the most precocious questions any adult ever entertained. She writes with precision, and yet her answers have just enough flare and playfulness to keep children coming back for more. Artist Scot Ritchie offers readers a tireless stream of bright, colorful and often-hilarious illustrations. He uses clear primary colors to decorate the simple drawings, and the result is like flipping through a book of your child’s favorite coloring pages. Brilliant! I fell in love with this book the moment I saw the cover, and after reading every single page of text and drinking in every illustration, I can understand why it has sold over 100,000 copies since its debut over ten years ago. It’s a great book designed for future great thinkers. For the ultimate WHY? book, be sure to pick up a copy of Why? The Best Ever Question and Answer Book about Nature, Science and the World Around You, by Catherine Ripley. Next articleA Bevy of Picture Book Workshops!